While a catcher for the Seton Hall University Pirates in 1987, Craig Biggio and two teammates – future MLB slugger Mo Vaughn and 1987 NCAA batting leader Marteese Robinson – were dubbed “The Hit Men.” After a brief time in the minor leagues through the first half of 1988, Biggio spent the next 20 years playing catcher, second base, and outfield for the Houston Astros. On June 28, 2007 he joined an exclusive club of Hit Men when he lined a seventh-inning single to center field off Colorado Rockies starter Aaron Cook for his 3,000th hit, which made him only the 27th major leaguer to reach that milestone. Trying to stretch that base hit into a double and getting thrown out at second also made him the first player to reach 3,000 hits on a play on which he was retired.1 Then, as if to make amends for that dubious distinction, Biggio sparked a two-out rally in the bottom of the 11th inning by beating out his grounder to shortstop for his fifth hit of the game. Three batters later, with the bases loaded with Astros, Carlos Lee gave Biggio’s historic night a storybook ending when he hit a grand slam home run for an 8-5 Astros victory. One experience that compelled Biggio to play each game as though it were his last was being knocked unconscious by a lightning strike that killed one of his teammates in a 1984 summer league game. Shortly thereafter, Biggio left for Seton Hall where, he later said, “I went in as a kid and I came out as a man.”3 Throughout his career, he also remembered his father’s teaching that he should finish what he started. As a result, in an era when players routinely switched teams to maximize their salaries, he opted to spend his entire career with the Astros for less money than he could have earned elsewhere. All of the people and events that marked where Biggio came from molded him into the player who, on January 6, 2015, learned that he was going into the National Baseball Hall of Fame, having received votes on 82.7% of the ballots cast in his third year of eligibility. Biggio demonstrated prowess in both baseball and football in high school. In fact, football was his preferred sport. He was prepared to quit his high school baseball team in the ninth grade, but Gordon Biggio intervened and reminded him, “You finish what you start.”6 Biggio’s father also arranged for his 14-year old son to play on a Connie Mack-league team for 15 to18-year old boys so that he could face tougher competition. In high school, Biggio started out as a catcher, played mostly shortstop during his junior year, and returned to catcher as a senior. He played catcher so well that he finished second in the voting for the Yastrzemski Award, which honored Suffolk County’s best baseball player. While Biggio honed his skills on the diamond and gridiron, he became impressed by his young neighbor Chris Alben’s struggle against leukemia. Biggio visited Alben often and, when the boy died at the age of eight, he became a surrogate big brother to Chris’s six-year old brother Charlie. Two-sport star Biggio, who had been a dominant running back as a senior and won the Hansen Award as Suffolk County’s best football player, accepted the honor in the name of Chris Alben. His interactions with the Alben children in his teen years contributed to a lifetime role as spokesperson for The Sunshine Kids, a charity dedicated to providing activities and emotional support for kids who are battling cancer. After high school, Biggio turned down a college-football scholarship offer to play defensive back at Boston University, and he rebuffed the Detroit Tigers’ inquiries as to whether he would sign a contract if they drafted him. Instead, he accepted a partial scholarship to play baseball under head coach Mike Sheppard at Seton Hall University in South Orange, New Jersey. Before leaving for college, Biggio played on a summer league team again and filled in at second base for one game. During the game, a storm blew in and lightning hit the playing field, knocking Biggio and his teammates to the ground. Shortstop Adriano Martinez, who was positioned to Biggio’s immediate right and was the lone player wearing metal cleats rather than rubber ones, did not get up again. According to a coach who was present at the game, “The bolt came down and evidently hit the backstop . . . It went under the ground and got him. It killed him.”7 With this experience fresh in his memory, Biggio departed home for Seton Hall. At Seton Hall, Biggio experienced firsthand the hard-nosed demeanor for which Sheppard was known, but he also appreciated the fact that the coach’s no-nonsense approach was intended for his benefit. Sheppard emphasized respect just as Biggio’s father had done, saying, “If you have respect, you will do the right thing.”8 In addition to giving respect, Biggio earned respect as he transformed himself from a player Sheppard called “the worst defensive catcher I had ever seen”9 into an All-Big East player during his sophomore season. Biggio was Seton Hall’s captain during his junior season (1987) and again received All-Big East honors. Although he batted .417 for the season, he did not even lead his team in hitting; that honor belonged to teammate Marteese Robinson, who led the NCAA with a .545 batting average that year. Biggio, Robinson, and Maurice (Mo) Vaughn were dubbed the “Hit Men” in a promotional campaign created by one of Seton Hall’s pitchers. Seton Hall was eliminated in the NCAA’s South Regional tournament, but Biggio and his two fellow sluggers became college legends and the subjects of a 2002 book titled The Hit Men and the Kid Who Batted Ninth, which examined their backgrounds, college careers, and early professional careers. After his junior season, Biggio entered the draft. His professional prospects were now much brighter than they had been in 1984, a fact Biggio later acknowledged as he conceded, “I think if I would have signed out of high school, I wouldn’t have lasted very long.”10 The scouting reports on Biggio projected him as a future major-leaguer. Scout Phil Rossi gave him “added points for [his] ‘hard-nosed’ and aggressive style of play.”11 Before Biggio was even drafted in the first round by the Houston Astros on June 2, 1987– the 22nd overall pick – both Rossi and fellow scout Billy Blitzer foreshadowed the path his career would take by noting his versatility and suggesting that he could play other positions in both the infield and the outfield. Biggio signed with Houston one week after he was drafted and was assigned to the Asheville Tourists of the Class-A South Atlantic League. He played in 64 games, starting 59 at catcher and batting .375 with 9 home runs, 49 RBIs, and 31 stolen bases. His performance helped Asheville reach the “Sally” League’s championship series, but the team lost in five games to the Myrtle Beach Blue Jays. In 1988, Biggio was invited to the Astros’ Spring Training camp, where he came under the tutelage of Hall of Fame catcher Yogi Berra, an Astros coach at the time. Biggio began the season with the Tucson Toros of the Triple-A Pacific Coast League, but he was called up by the Astros on June 26, 1988 after an injury to starting catcher Alan Ashby had put the team in the precarious position of having only one available catcher. In Biggio’s first start, on June 26, he caught Jim Deshaies’ 6-0 shutout of the San Francisco Giants, a game in which he walked once, stole a base, and scored his first run. On July 9, he caught Nolan Ryan’s 100th victory for the Astros, a 6-3 win over the New York Mets. Biggio struggled at the plate, however, and Alex Trevino began to get most of the playing time at catcher. Once Ashby was healthy, Biggio was optioned back to Tucson on August 30, having batted .202 in 36 games. His second stay with the Toros was a short one, though, as he was recalled on September 6 when the Astros expanded their roster. After that, Biggio never played in another minor-league game. The Astros entered a rebuilding phase following the 1988 season and served notice that Biggio was their catcher of the future by releasing longtime starter Ashby on May 11, 1989. The 1990’s were a watershed time in Biggio’s personal and professional lives. In February 1990, he married his girlfriend Patty Egan, whom he had met while at Seton Hall, and the couple now has three children, sons Conor and Cavan and daughter Quinn. In 1991, Biggio’s progress as a major-league player was rewarded when Cincinnati Reds manager Lou Piniella chose him as an All-Star reserve catcher. The All-Star selection did not keep the Astros from proposing a change prior to the 1992 season – a move from catcher to second base – that soon turned Biggio into a superstar. Biggio learned well and was picked as an All-Star reserve second baseman in 1992, becoming the first major-league player to be selected as an All-Star at both catcher and second base. Biggio and Jeff Bagwell, the 1991 National League Rookie of the Year, combined to usher in an era of sustained success for the Astros that was unlike any prior period in franchise history. From 1994 to 2006, the team won four division titles and finished in second place eight times; on two of the latter occasions, they captured the wild-card spot, and the 2005 wild-card team won the Astros’ first and only NL pennant. Biggio and Bagwell played together for 15 years and were nicknamed the “Killer B’s,” a group that at different times also included teammates Sean Berry, Derek Bell, and Lance Berkman. Both Biggio and the Astros continued to improve. The team won its first NL Central Division title in 1997, a season in which Biggio banged out 191 hits, stole 47 bases, and scored 146 runs. In addition to those numbers, he managed the remarkable feat of grounding into zero double-plays in 619 official at-bats. 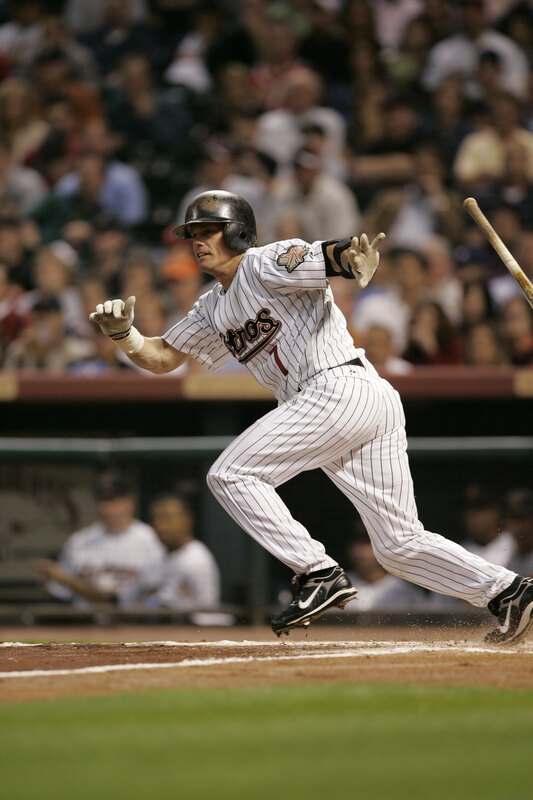 Biggio’s best season came in 1998 when he batted .325 with 210 hits, 20 HRs and 88 RBIs, and he became only the second major leaguer ever – along with Hall of Famer Tris Speaker – to have 50 doubles and 50 stolen bases in the same season, recording 51 and 50 respectively. The Astros won three consecutive division titles from 1997-1999, but they were eliminated in the first round of the playoffs each year; the only blight on Biggio’s career to this point was his lackluster performance in the postseason. A new decade in a new century would eventually, although not right away, bring about changes in both circumstances. In 2000, the Astros moved into their new ballpark, Enron Field (now Minute Maid Park), but the success they had enjoyed in their final three years in the Astrodome eluded them as they finished in fourth place with a 72-90 record. Biggio, who struggled to a .268 batting average in 101 games, had his season come to a premature end on August 1 at Miami’s Pro Player Stadium. Florida Marlins center fielder Preston Wilson slid hard into second base to break up a double play, hitting Biggio’s leg and tearing both the anterior cruciate and medial collateral ligaments in his left knee. It was the only injury in Biggio’s career that caused him to miss any significant amount of playing time, and he vowed to come back strong the next year. Biggio and the Astros both rebounded in 2001 as the team won its fourth NL Central title in five years with a 93-69 record. Biggio batted .292, registering 180 hits and scoring 118 runs, but the Astros were once again eliminated in the first round of the playoffs by the Atlanta Braves. 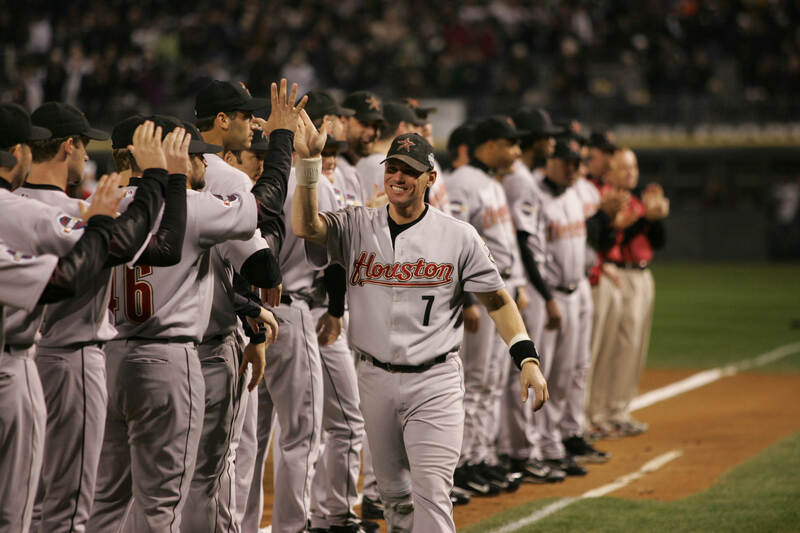 After the Astros finished in second place in 2002, the team aimed to improve its fortunes via a move that also impacted where Biggio would play: They signed free-agent second baseman Jeff Kent, a slugger who had won the 2000 NL MVP Award while playing for the San Francisco Giants. For the second time in his career, Biggio was asked to change positions – this time to center field – only now the switch was made to accommodate Kent rather than Biggio. The 2003 season was one of adjustments, but greater success came in 2004. After a mid-season managerial change put Phil Garner at the helm, the Astros charged to a 92-70 record and made the playoffs as the NL’s wild-card team. For the first time in franchise history, the Astros won a postseason series when they defeated the Atlanta Braves in five games, and Biggio broke out of his postseason doldrums with a .400 batting average that included eight hits and four RBIs. The Astros faced the Cardinals in the NL Championship Series, and Kent hit a walk-off home run in Game 5 that gave the Astros a 3-to-2 game lead; however, the Cardinals came back to win the NLCS, leaving the Astros one step short of the World Series. Kent left the Astros to sign with the Los Angeles Dodgers after the 2004 season, and Biggio returned to second base. As the 2005 season began, a repeat of the previous year’s postseason exploits appeared unlikely. Kent was gone, Bagwell spent most of the year on the disabled list, and a now 39-year old Biggio batted .264 for the season. In late May, the team had a 15-30 record, and its season was declared dead by a Houston Chronicle article that was accompanied by a drawing of a tombstone; however, a 22-7 July began a run to an 89-73 record and a second consecutive NL wild card playoff appearance. The Astros again eliminated the Atlanta Braves and, in a reversal of the previous year, defeated the St. Louis Cardinals in six games in the NLCS to earn the franchise’s first trip to the World Series. Biggio continued his late-career postseason upsurge by batting .316 with six hits and six runs against Atlanta and .333 with eight hits against St. Louis. World Series Game 3 – on October 25, 2005 – was the first World Series game to be played in Texas, but the excitement of the moment was fleeting as the Chicago White Sox swept the Astros in four tightly-contested games. In 2006 spring training, Bagwell realized that the shoulder injury that had caused him to miss most of 2005 now meant the end of his career; he began the season on the disabled list and, after missing the entire year, officially retired in December of that year. Thus, Biggio was separated from the teammate with whose career his own had become inextricably linked. Their run of success had led Minute Maid Park to be referred to as “The House That Biggio and Bagwell Built,” and statues of both players stand outside of the stadium. As for their many years together, Bagwell had said in 2003, “It’s been like a marriage more than anything else. You go through the same emotions.”19 Time had passed, though, and the end of an era neared as Biggio posted a.246 batting average in 2006 and the Astros managed only an 82-80 record. After 2006, Biggio signed a one-year contract with the Astros which made it evident – though he had not yet made a formal announcement – that 2007 would likely be his final year. He entered the season only 70 hits short of 3,000, and the fans and media focused on his pursuit of that goal. From the moment of his 3,000th hit onward, Biggio’s remaining time with the Astros appeared to follow a Hollywood script, beginning with the game-winning rally he started in the eleventh inning of that June 28th game. On July 24 Biggio made the official announcement that he would retire after the season, and that evening he hit a game-winning grand slam in a 7-4 victory over the Dodgers. In his penultimate game on September 29, against the Braves, Biggio started at catcher for the first time since October 5, 1991, and caught two innings behind the plate before moving back to second base. Finally, on September 30, after his final game, Biggio took a lap around Minute Maid Park, tipped his cap to the fans, and went home into retirement. Biggio’s final career numbers included a .281 batting average; 3,060 hits; 1,844 runs; 668 doubles; 291 home runs; 1,175 RBIs, and 414 stolen bases in 2,850 games played. His 53 leadoff home runs are the National League record, and he also holds the modern major-league record for most times hit by a pitch with 285, placing him two behind all-time leader Hughie Jennings who played most of his career in the 19th century. In addition to his on-field accomplishments, Biggio won the Branch Rickey Award for community service in 1997 and the Roberto Clemente Award, which is given to “the player who best exemplifies the game of baseball, sportsmanship, community involvement and the individual's contribution to his team,” in 2007. 21 The following season, the Astros honored Biggio by retiring his uniform No. 7 on August 17, 2008. When he had announced his retirement on July 24, 2007, Biggio had expressed a desire to spend more time with his family. After the head baseball coach at his sons’ school – St. Thomas High School in Houston – departed for another job, Biggio stepped in to coach the team and led it to Texas Class-6A state championships in 2010 and 2011. At this writing, Conor and Cavan Biggio both attend Notre Dame University and play on the baseball team there, while Craig Biggio has retired from high school coaching. He continues his work with The Sunshine Kids and serves as a special assistant to the Astros’ general manager, in which capacity he assists with player development, scouting, and talent evaluation. Brown, Bill and Mike Acosta. The Houston Astros: Deep in the Heart (Houston: Bright Sky Press, 2013). Siroty, David. The Hit Men and the Kid Who Batted Ninth (Lanham, Maryland: Diamond Communications, 2002). 2 National Baseball Hall of Fame, “Craig Biggio Conference Call Transcript,” http://s3.amazonaws.com/website-docs/media/transcripts/Biggio+transcript.pdf, accessed March 20, 2015. 4 Michael Bamberger, “Second Effort: A Work Ethic Instilled By His Father Helped The Astros’ Craig Biggio Convert From All-Star Catcher To Gold Glove Infielder,” http://www.si.com/vault/1996/04/01/211541/second-effort-a-work-ethic-instilled-by-his-father-helped-the-astros-craig-biggio-convert-from-all-star-catcher-to-gold-glove-infielder, accessed March 7, 2015. 11 Phil Rossi, “Free Agent Report – Craig Biggio,” http://scouts.baseballhall.org/report?reportid=05360&playerid=biggicr01, accessed April 23, 2015. 12 Bill Brown and Mike Acosta, The Houston Astros: Deep in the Heart, 132. 13 Brown and Acosta, 133. 16 Brown and Acosta, 133. 18 Jeff Pearlman, “Jeff Kent’s big bat will more than justify the displacement of Craig Biggio,” http://www.si.com/vault/2003/03/31/340612/2-houston-astros-jeff-kents-big-bat-will-more-than-justify-the-displacement-of-craig-biggio, accessed March 7, 2015. 19 Steve Rushin, “Beege and Bags Forever,” http://www.si.com/vault/2003/06/09/344324/beege-and-bags-forever, accessed March 7, 2015. 20 Alyson Footer, “Biggio shares moment with Bagwell,” http://m.astros.mlb.com/news/article/2055760/ , accessed July 9, 2007. 21 MLBcommunity.org, “Roberto Clemente Award,” http://web.mlbcommunity.org/programs/roberto_clemente_award.jsp?content=about, accessed May 16, 2015.